Margaret Of Provence was married to a saint. A real saint. Her husband, Louis IX of France, was a model of the ideal Christian monarch, and the only French king to be declared a saint. Their marriage was arranged for political reasons. 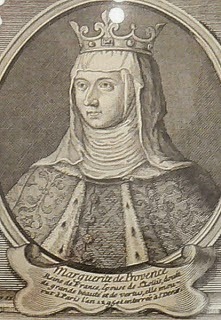 The Queen Mother, Blanche of Castile, needed the support of Raymond Berenger IV, Margaret’s father, in a war against the English. So, on 27 May 1234, the couple tied the knot. The next day, the 13th year old bride was crowned Queen. The couple would have 11 children together. Margaret was both beautiful and kind. But that didn’t make life at the French court any easier. Her mother-in-law never liked her much. She thought Margaret was too ambitious and disliked her fondness for the English (Margaret’s sister Eleanor had married the English King Henry III), and always treated her badly. Her relationships with her husband was more complex. While Margeret had a forceful personality, Louis was a very pious man. So, although he cared deeply for his wife, the two were often at odds. Despite their problems, though, Margaret was one of Louis’ closest advisers. She also followed him on crusade, and gave birth to her son, Prince Jean Tristan, at Damietta. When her husband was captured, Margaret showed what she was made of. She became the leader of the crusade, the only woman to have ever done so, and oversaw the negotiations for her husband’s release, gathering enough silver for his ransom. That wasn’t enough to gain the approval and love of her subjects though. In France, people found her opposition to Charles of Anjou, who was married to her sister Beatrice, odd. Distrust against her grew when, in 1263, she had her son Prince Philip take an oath promising to obey her until he was 30, even if he should succeed to the throne before that. Louis wasn’t happy. She thought Margaret had crossed a line, but the oath was binding and sacred. Therefore, only the Pope could release Philip from it. The King duly petitioned him and the Pope accepted his request. The next time King Louis left on a crusade, Margaret stayed at home. But Louis would never come back. He died at Tunis, in North Africa. Margaret then returned to Provence, where she tried to enforce her claim to rule. Charles of Anjou would have none of it. War loomed, and Margaret summoned to her aid her nephew, King Edward II of England, her son, and the King of Germany. She kept control of the country until 1285 when, after Charles’ death, Philip the Bold persuaded her to give up her rights to Provence in exchange for an income form Anjou. Margaret died in 1295, aged 74.